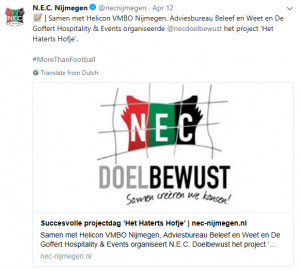 In cooperation with Helcion VMBO Nijmegen, the advisory office Beleef en Weet and the Hospitality and Event department of De Goffert stadium, NEC Doelbewust organised the project ‘Het Haterts Hofje’. The project followed the goal of making children aware of the importance of healthy eating and a healthy lifestyle. Last Tuesday, more than 60 primary school children were welcomed to take part in the project. T he workshop was kicked-off in the morning by Martijn van Bergen from NEC Doelbewust. Afterwards, the children had the opportunity to present posters with images of fruits and vegetables which they had drawn earlier in school. Additionally, the children took part in an experiment in which they tasted fresh vegetables. Afterwards, the children presented each other their healthy lunch, which they had prepared in advance at home. Bram and Robin from primary school Sint Nicolaas tell that they baked a healthy lunch with dough and three different healthy ingredients. In order to make it very special, they included the colours of NEC Nijmegen; red, green and black. Mohammed who is a pupil at primary school Hidaya tells that he brought a fresh orange juice and muesli with yogurt and without sugar to the workshop. Luc van ES, teacher at Helicon VMBO Nijmegen states, ”vegetables are not the most popular food among children. However, if children get the opportunity to prepare and cook the vegetables themselves, they are more willing to try them.” Luc adds, “ soon the growing season will start again and we will start the project of getting the children involved in growing their own vegetables in the school garden”. The school garden is called the Haterts Hofje, which explains the name of the workshop. Yet, the workshop is not only centred around healthy eating. Instead, it focuses on an overall healthy lifestyle. Such a workshop is a great opportunity to make children aware of the importance of a healthy lifestyle. During the workshop, the children had additionally the opportunity to cook under the supervision of professional chefs, using a wide range of healthy products. The tasks were divided in washing and cutting the fresh vegetables. After the great effort of cooking together, the children enjoyed a self-cooked healthy soup. Martijn from NEC summarised, “we can look back on a fantastic afternoon during which we were able to teach the children about the importance of healthy eating and a healthy lifestyle. It is great that NEC is able to play such an important role in the project”.